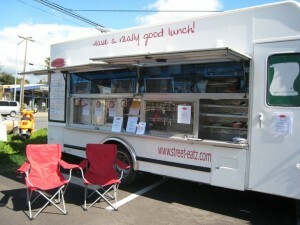 Street-Eatz – Santa Rosa, CA (@streeteatz) – Food Truck Talk – Searching for the best foodtrucks! Just 55 miles north of San Francisco lies Santa Rosa, CA. Certainly not a hot bed of food trucks, but truly a great place to live as it combines wine country and farm country, redwood forests and rivers, lakes and ocean. And a charming and thriving downtown without all the strains of city living. 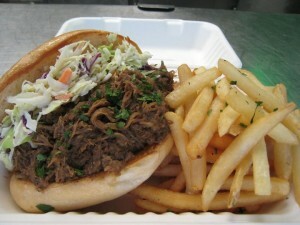 At the top of their menu is the Pulled Pork Sandwich with Jamaican Jerk Sauce, The pulled pork is slow braised and covered with a sauce that differentiates this sandwich from a traditional bbq sauce covered sandwich. Jamaica is not the only country or region featured on the Steet-Eatz menu. How about the New Orleans spicy chicken pasta (Penne pasta with spicy chicken and sun dried tomatoes in creamy sauce), the Agedashi-Japanese Fried Tofu (crunchy tofu pieces in seasoned broth with fresh ginger and green onions), or the La Tex Chicken Flautas Plate (tortillas rolled with shredded chicken then fried to a crunch. Served with rice, beans and pico de gallo). 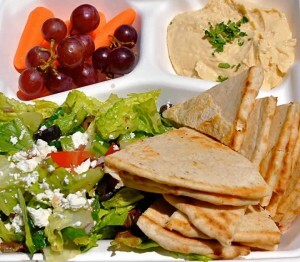 Street-Eatz also has a variety of meatless lunch items including the Meditteranean Plate which includes a salad of romaine, olives, feta, tomato served with toasted pita bread, veggies and homemade hummus. A very healthy lunch! Jillian Dorman and Alma Mendez are the Street-Eatz owners and they certainly have the passion to provide the Santa Rosa community with a creative menu that fits the lifestyle outside of the big city.